This Special Warehousing Project was to transport an 8000 sq. ft. structural mezzanine, we were required to record current existing layout specs, create a component inventory, create a Bill of Materials (BoM), label all individual components, dismantle the structure comprising of the; electrical system, fire sprinkler system, 2 sets of stairs, 2 elevated dock plates, lighting, cat5 wiring, prepare the components for shipping and transport the structure offsite, all while keeping the site safe, secure and clean. This particular mezzanine consists of structural pallet racking components allowing for racks storage, bulk storage and work space on the upper level, while the bottom level allows for multiple rows of customizable multi-tier picking configurations which naturally flow to a built in packing/ shipping line. Propeller, Inc. from time to time takes part in a special warehousing project. We have the equipment, manpower and storage infrastructure to handle large projects. If you have products that require unique fulfillment and warehousing needs Propeller will be able to help. Feel free to browse our services, portfolio and drop us a line if you have a need for our services. Propeller Inc. prides itself on being a successful fulfillment company in Provo, and we have a great example of a fulfillment project we worked on. We were commissioned to build a Mobile cabinet for 3D Face scanning equipment. The project started at our Provo fulfillment location with an initial whiteboard sketch that underwent refinements until a wire-frame was built in CAD software. With the refinements completed in the Computer Model, we created a cardboard mock up to review the display with the customer. After all adjustments had been made to the project, the computer model was then blueprinted in our Provo fulfillment warehouse and sent to the fabricator. At the fabricator, a metal prototype was then fabricated and assembled. The computer hardware was installed in the first prototype. After all tests were complete, we then made all necessary updates to the Computer model, and sent the final blueprint to the fabricator. After the fabricator received the blueprint, they fabricated the final assembly components. After we received the raw components at our Provo fulfillment location, we proceeded with the assembly of the ordered displays. The 3D face scanning equipment was provided by the customer. Their hardware uses an RGB camera and depth sensor running proprietary software, which provide 3D capture and facial recognition. A high-end DSLR is then used to capture a high resolution image of the user’s face. The customer’s software then merges the data together to provide a 3D model to be used in custom action figure manufacturing. 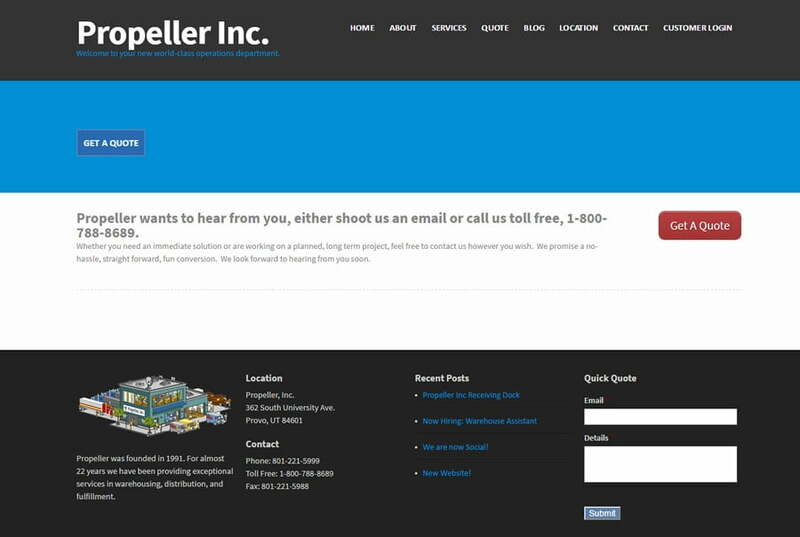 Propeller, Inc. has redesigned its website! With the latest redesign potential customers can find the information they need to make an informed decision on the services Propeller, Inc. offers. The Redesign implements a focus on Propeller’s Warehousing, Fufillment, Kitting and Assembly services. The logic here is to provide our clients and future customers a better understanding on the services we offer. Our services are the driving force of Propeller! With this in mind we listed the services on the front page with buttons for the visitor if they want to read more about the service. Our Portfolio was added to show off our past work in Displays & Packaging. Propeller is proud of our work we have done in the past, Take a look at what Propeller has to offer by browsing the portfolio and learning about the services rendered for each project. 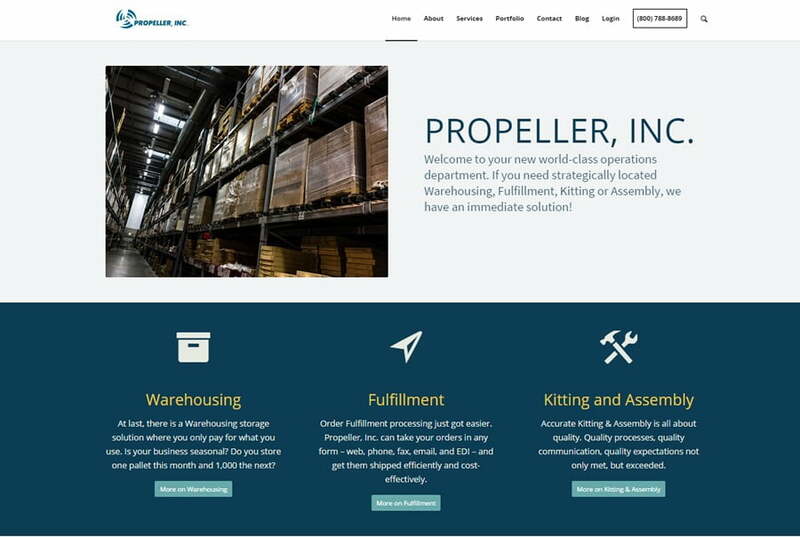 Propeller, Inc. is a full-service 3PL providing order processing, warehousing, shipping, kitting and assembly, packaging, invoicing (including EDI), returns management and materials procurement. Propeller was founded in 1991. For close to 25 years we have been providing exceptional services in warehousing, distribution, and assembly services. Propeller, Inc. was founded in 1991 by Earl and Julie Christensen to distribute portable computer components.